Bloomsbury USA Childrens, 9781681194851, 128pp. Maggie's adventures in the Enchanted Forest continue in the fourth book of a new chapter book series by E. D. Baker! 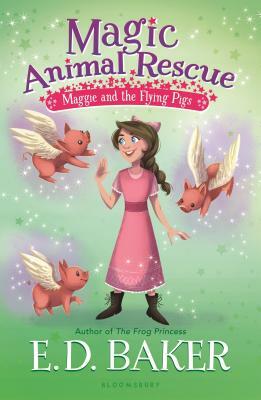 Maggie's newest chore at her friend Bob's stable is taking care of flying pigs -- but they're not so easy to deal with! Maggie's used to putting up with a lot though, like her step-mother Zelia, who is trying to get Maggie's step-brother Peter a job at the stable. Peter working with Maggie? Yeah, right! Maybe when pigs fly . . . This black-and-white illustrated series is perfect for fans of Princess Ponies, Magic Horses, and Critter Club. E. D. Baker is the author of the Tales of the Frog Princess series, The Wide-Awake Princess series, The Fairy-Tale Matchmaker series, and many other delightful books for young readers, including Fairy Wings, Fairy Lies, and A Question of Magic. Her first book, The Frog Princess, was the inspiration for Disney's hit movie The Princess and the Frog. She lives with her family and their many animals in Maryland. Lisa Manuzak is a concept artist, illustrator, and designer. Born and raised in Hawaii, she currently resides in upstate New York with her fiancé, two fluffy cats, and many fish.